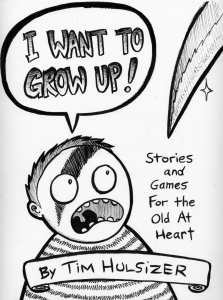 I Want To Grow Up: This mini is 16 pages, b&w. 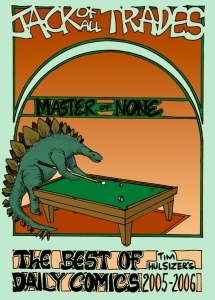 Darkly humorous short stories and games that appear to be aimed at children, but are in fact meant for twisted adults. Arrives signed and with a sketch inside. This book is $3. Only 2 copies left! 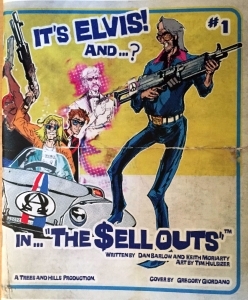 $ell Outs #1: This is the 26-page premiere issue, b&w. It’s dead musicians and actors against dead politicians in this action-packed (and guest star-packed) comic! This book is $3. Only 2 copies left! Gimme Shelter: This mini is 20 pages, b&w. Contains drawings I did for the cats’ cage cards at the Monadnock Humane Society where I used to work. All proceeds go toward animal care at the shelter. This book is $3. 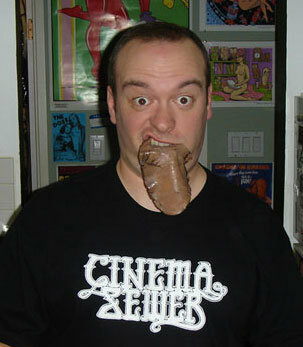 Cinema Sewer t-shirt: Show your love for Robin Bougie’s filthy, hilarious and educational movie zine Cinema Sewer! Shirts are $10. Screenprinted on high quality t-shirts. Sorry, size M is now SOLD OUT. 2 smalls left, 1 large size left, and 4 XL size left as well. Jack of All Trades: This thick mini is 50 pages, full color. Collects the first 2 years of my run of daily comic strips which ran 2005-2009. Arrives signed and with a sketch inside. SOLD OUT!